I am sorry that it has taken me so long to report back on the Shadow Riders WA run out to York a few weeks ago but I have been very busy. It was the perfect day for a ride with no wind, blue skies, and just the right temperature, or as I like to call it a goldylocks zone: not too hot, not too cold. lead us back to Great Eastern Highway where the group reformed at a service station, except Graham, who had tried to do the 320km on one tank and had come to a stop about 30km short. SRAWA president Phil kindly made a run back with a 5 litre jerry can of fuel. We all regrouped at the local Dome in Sawyers Valley for a last coffee and some banter, mostly at Graham's expense, and then disbanded and headed home. 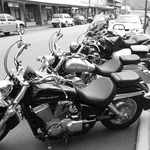 Our next ride will be on Anzac day and I will post the details soon. I thought the unplanned stop was going to be our little secret. 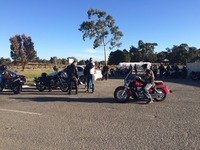 So great to see a WA ride report.